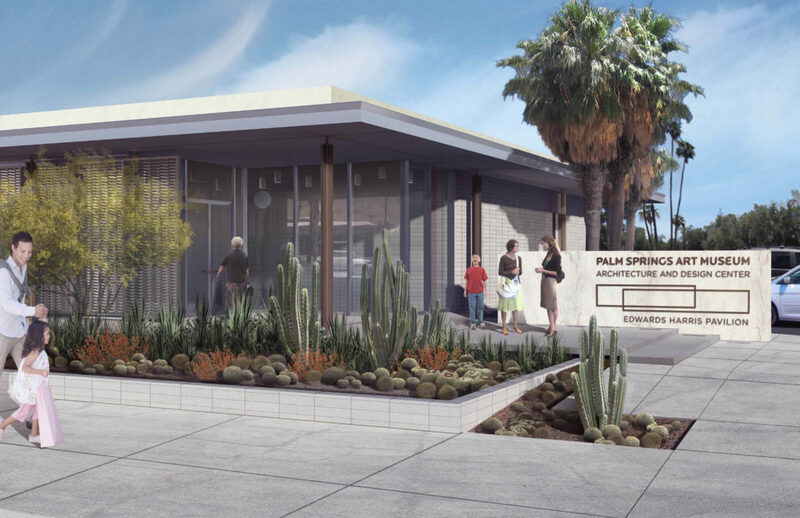 Ever since the Palm Springs Art Museum acquired the former Santa Fe Federal Savings and Loan building on Palm Canyon Drive last June, and announced plans to transform the bank into an architecture and design museum, a ground swell of support has been growing. The concept has also garnered considerable national and media attention. The museum is currently raising funds for the rehabilitation of the Class 1 Historic modern building, to create a first-in-the-county free-standing architectural museum, housed in a modernist building and owned by a museum. To date, a Founders Group of some 30 prestigious leaders and entrepreneurs have signed on. The museum is seeking at least 100 founding members, each pledging a $25K commitment payable over three years. Interior rendering courtesy of Marmol Radziner Architects, FAIA. 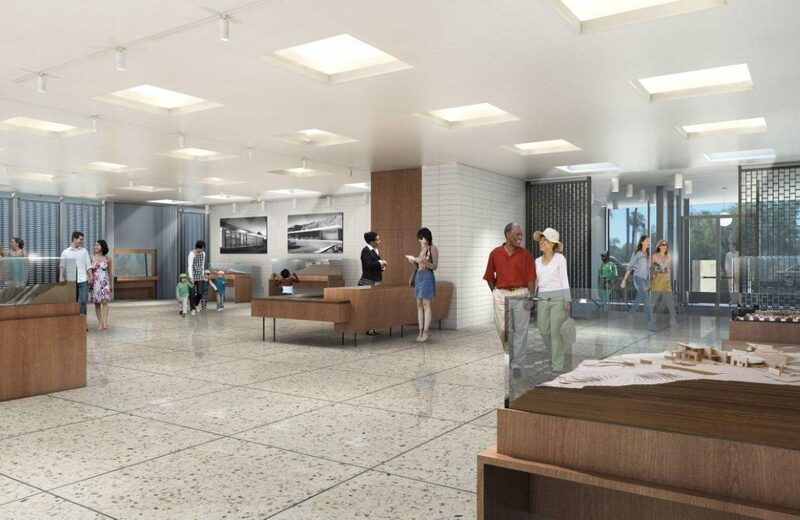 Designed by renowned Mid-Century Modern architect E. Stewart Williams, this new annex of the museum will be devoted to architecture and design exhibitions, programs, archive study space and will house the museum’s growing collection of architecture and design archives. The Edwards Harris Pavilion was named for Beth Edwards Harris, an architectural historian, who with her husband Brent, a successful investment manager, are credited for igniting the Mid-Century Modernism revival here after they painstakingly restored Richard Neutra’s Kaufmann House that, fallen into abandoned disrepair, was set for demolition by the early 1990s. Ardent preservationists, they are among the earliest supporters of historic preservation in a city now respected for its remarkable collection of Mid-Century Modern architecture. Los Angeles restoration architects Marmol Radziner and Associates were commissioned to restore the Kaufmann house, and have been selected to perform the rehabilitation work on the Edwards Harris Pavilion. Following the “master builder” tradition, Marmol Radziner integrates design with a variety of in house skills including architects, metal fabricators, carpenters, cabinet-makers, and construction crew. The Kaufmann house restoration has become a local legend, reaching a zenith when Marmol Radziner had a long-closed Utah sandstone quarry reopened to mine for matching stone to complete a stone wall. The firm’s and the Harris’ exhaustive search for authentic fixtures and materials remains unmatched, sparking a passion and quest among preservationists and fans for Mid Century Modern furnishings, artwork and fixtures. Today, Palm Springs Uptown Design District pays homage to this revival in scores of shops and interior design firms. William’s vision was to create a commercial and community space. The building’s basement with a kitchenette was used as a meeting space for local organizations. The lower level will now become a research library with cabinets for architectural blueprints. Plans include adding an elevator, restoring perimeter retaining walls, replacing the movable anodized aluminum screens that had been stolen, and glass panels to replace the ATM nook on the building’s southwest corner, as per original blueprints. The firm has already removed office dividers to create an open space; removed carpeting to reveal the original Terrazzo floor; and replaced plants with sustainable desert landscape. As the firm did with the Kaufmann house, Marmol Radziner is restoring the building with the help of Williams’ original plans as well as black-and-white photos by iconic photographer Julius Shulman. A hallmark of modernist thinkers, Williams always designed buildings to complement their surroundings. The southern area of downtown Palm Springs was already established as a bank district by the early 1960s. Williams was also forward thinking in adding a drive-up teller window here, one of the first in California. In 1964, Williams formed an architectural collaborative with Albert Frey, William Cody and John Porter Clark to design a master plan for the redevelopment of the downtown business district. But Palm Springs downtown merchants were resistant to the plans, according to son Erik. “They wished to retain the small village atmosphere.” Spanish Revival architecture was predominant at that time. The project that could have made Palm Springs into a Modernist city never made it past the planning stages. The Santa Fe building, a hint at what downtown might have been, ironically, will become a center that celebrates the modernist masters. For more information on becoming a donor to the Edwards Harris Pavilion, Architecture and Design Center, contact Greg Polzin, director of fundraising and development, gpolzin@psmusuem.org or 760-322-4820. Palm Springs and the desert area boast among the largest collections of important Mid Century Modern designed public buildings, private homes and estates in the country. Quotes and information also cited from “A Space for Design” by Matthew Link, Palm Springs Life Magazine, February, 2012; and “The Hidden History of the Kaufmann House” by Patrick McGrew, June 12, 2012, online at www.peakconstructionanddesigncalifornia.com.